Ever since IronKey hardware business was sold to Imation, we have heard little about it from its new owner. Now we know the company is trying to bring its security-hardened flash drive to mobile workspace market. 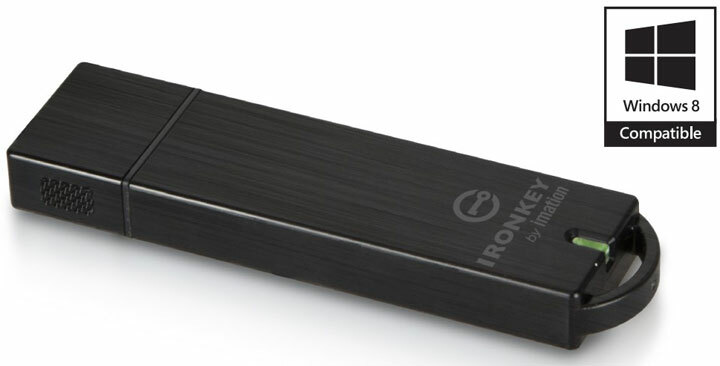 The Imation’s IronKey Workspace adds to short list of flash drives certified for Windows To Go, which most geeks are aware as Redmond’s own PC-on-a-stick solution. This allows a more consistent working environment available to improve productivity for road warriors, provided of course they have access to at least a 64-bit PC with USB boot enabled. Though you will also need a copy of Windows 8 Enterprise which is the only version that allows corporations to legally prepare these Windows To Go devices. To be certified as Windows To Go, a USB 3.0 flash drive needs to reach a level of sustained random access speed for 4k files. In the case of Kingston’s competing solution, the performance is rated at 3750 and 9800 IOPS for read and write respectively. IronKey Workspace is said to exceed the minimum requirement by 5 times. While Imation didn’t disclose the figures for 4k operations, the average read and write is around 300MB/s and 200MB/s respectively. The drive’s security is handled by 256-bit AES full disk encryption in addition to BitLocker password protection. Those interested can get one for $129 (32GB) to $389 (128GB).